The Android platform is known for its flexibility and customizability. It’s an open world where features can go as far as developers can dream with their eyes wide open and with limits which can only be curtailed by hardware configurations, or by a Manufacturer’s restrictions on the device. To customize an Android device to its full potential, Rooting is an essential step, and readers can read our articles on Rooting and its advantages and on determining whether their device can be rooted for more information. However, most user’s on their beautiful journey to customize their device do not stop at rooting. The primary advantages of Rooting are its ability of providing the user with the power to modify his device with custom mods and new ROMs, which are essentially modified versions of the Android OS. The appeal of these flashable ROMs arises from the fact that they incorporate different mods, most of which haven’t been provided by the manufacturer on the stock device. For more information, readers can refer to our articles on advantages of Flashing Custom ROMs and on how to flash a ROM. Flashing ROMs results in users gaining all modifications present in the ROM at once. Though options to choose the modifications which the user would require in the new ROM while flashing are being introduced, most custom ROMs consist of simple update zips which are flashed through a custom recovery such as TWRP. That means, users will normally get all features of that particular ROM, whether they like them or not, without the choice to choose those which they might prefer. Moreover, through flashing, the ROM storage, or those secured system files related to the device’s OS which are deemed the most important, will also be modified in a way which has a slight chance of turning out to be harmful for the device, especially as the APK files or the software packages related to various system apps are being modified. There are users who due to the presence of these very facts in their minds refuse to flash ROMs, or even fear rooting their devices. However, a particular custom framework for Android devices, the Xposed Framework, is capable of providing users with a solution to these issues. 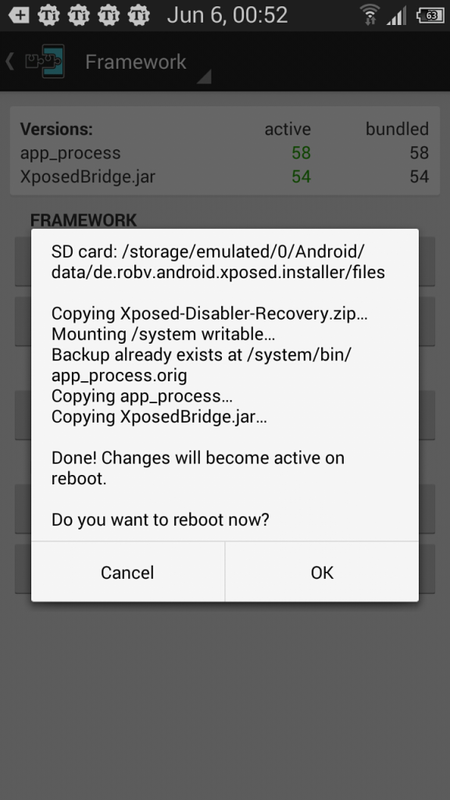 The Xposed Framework is a game-changer for those of us who want to modify their device. Created by a developer named roco89, it is a framework which modifies the ROM without changing the APKs, and does not require flashing through the custom recovery. All users need to do is sideload an apk file (Sideloading is essentially installing apk files which have not been obtained from official app stores) containing this framework to their device, and then install this framework. And once users have installed this framework on their devices, they merely have to download and activate various modules for this framework from a library which comes with the framework. The beauty of this framework lies in the fact that users don’t have to install a huge package consisting of hundreds of mods – the can easily choose the various mods they like, and even choose mods which change the same functionality of the device, which might not be possible through merely flashing a ROM. Thus a user interested in multitasking through multiwindows can have the XHalo Windows Mod commonly associated with the Halo mod of Paranoid Android ROMs and use it along with the MultiWindow Mod from OmniROM, if he so desires, or choose any other combination of any other number of modifications. While it will be wrong to say that developers have completely stopped concentrating on developing new ROMs with the introduction of the Xposed Framework, after looking at the humongous and booming library of the modules associated with the framework, one can fairly assume that Android Developers all over have started flocking to the framework. The first and foremost requirement for the framework is a rooted device. The presence of a custom recovery will also help, especially as it is suggested to take a NANDroid backup of the device before progressing. For how to take backups using custom recovery and on other methods to take backups, users can refer to our articles on taking backups. 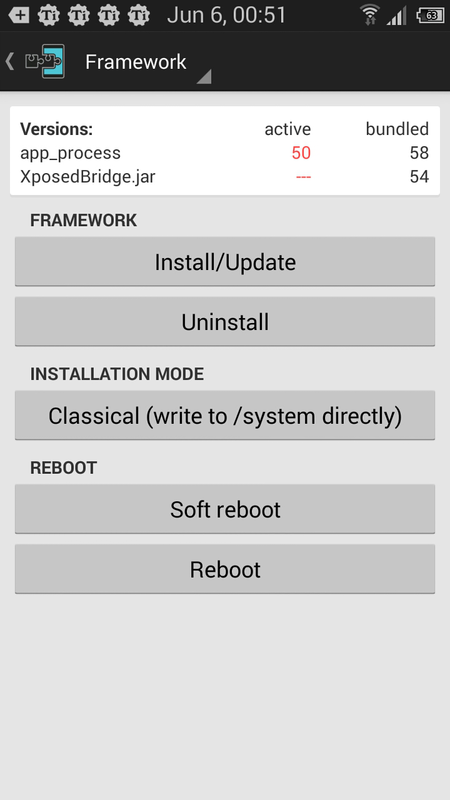 Users can start off with downloading the Xposed Framework from http://dl.xposed.info/latest.apk. The link provided downloads the apk file associated with the framework and once this has been downloaded, users can go ahead and sideload this apk on their devices. Once the framework app has been installed, the next step consists of installing the framework itself, which can be done by clicking on ‘Framework’ on the apps home page and choosing the ‘Install/Update’ tab. The device will immediately ask for SuperUser Request from the user through the already installed SuperUser app. On providing SuperUser access, the framework would be installed. A reboot will be required for the framework to become active, and a pop up window will come up on the device’s screen, stating the same. Users can click on ‘OK;’ to reboot the device, or select cancel and reboot the device normally. It is essential for readers to realize that the framework doesn’t do anything on its own, it has merely laid the foundation for running of the modules, and actual modifications and functionalities will only be triggered once the respected modules have been downloaded. In the next section, we will talk about how to install a module. 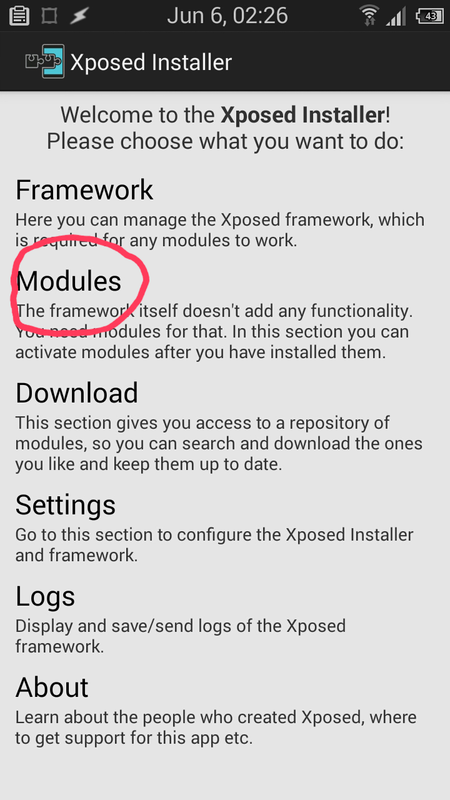 Once the Xposed Framework has been downloaded, installed and activated on a device, users can download modules throught the ‘Download’ section from the home page of the Xposed Installer app. A huge repository of modules will open for the user and depending on his device, he can download a suitable module. Searching on the module library with the module name will bring up the module. To initiate the process to download the module, users can click on the displayed Module name. A new page will open in the app on clicking the Module name. This page will provide the description of the module along with a XDA-Developers forum link of the module. Users can read the description and also visit the linked forum to learn more about the particular module. Swiping a finger from right to the left on this page will bring up the adjacent page. This page will be labelled ‘Download’ and will consist of information regarding the various versions of the module. 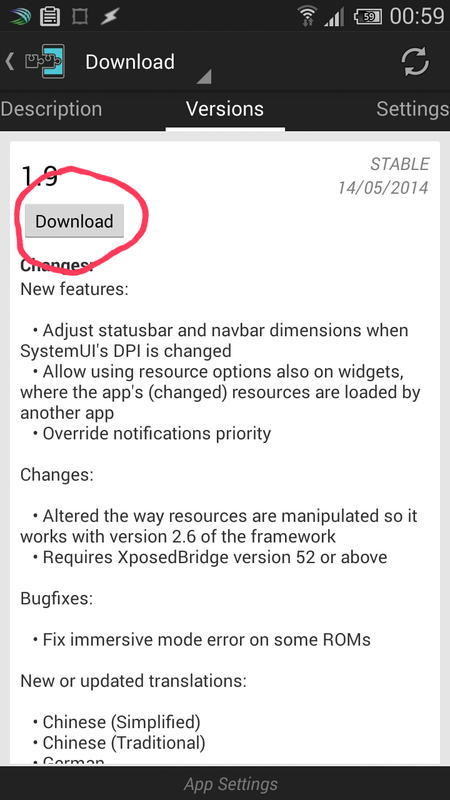 Here, users can go ahead and select ‘Download’ to finally download the module apk. This apk can also be sideloaded to the device. The last step consists of activating the particular module that has been downloaded. 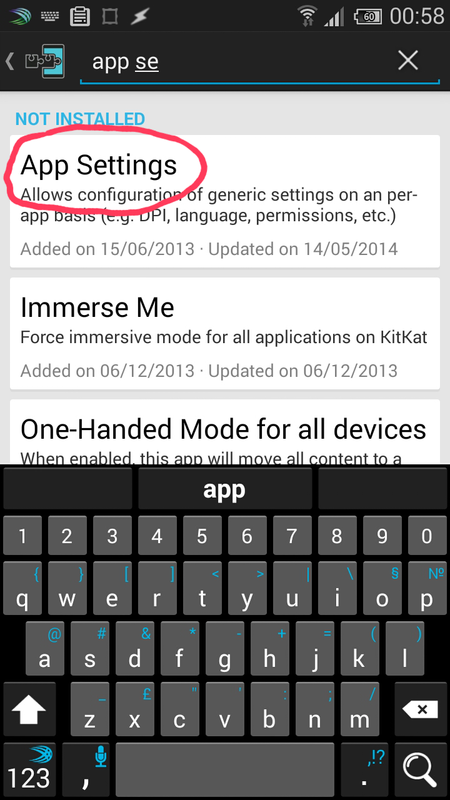 For this, the user has to access the ‘Modules’ section from the Home page of the Xposed Installer app. Once the Module section opens up, users can select the tick mark against the recently donloaded and installed module to activate the module. The module can similarly be deactivated by de-selecting the tick mark. A reboot would be required for starting off the module, after which the module would be completely activated with its respected functionalities. 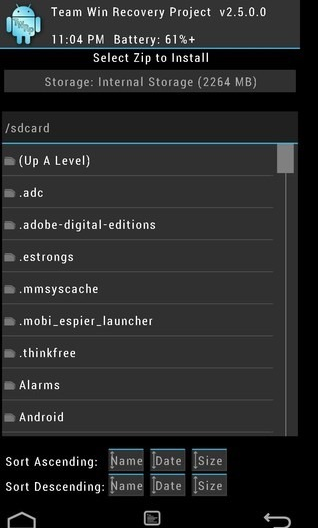 There is a vast reservoir of modules that has been building up in the Xposed Libraries. These provide a variety of functions, ranging from as simple as to switching the battery notification colour to as complex as to run HTC Sense UI features on Samsung devices. It doesn’t exactly nullify the process of Flashing ROMs, but it is getting there fast. Users interested in more information about the framework can read the Xposed Framework XDA Thread. The thread also includes a very handy Xposed Diabler, which is a zip file capable of being flashed through recovery to disable the module in case the user runs into any software hurdles. The Xposed Framework is quickly becoming an integral part of every rooted Android device, and will only grow in the future providing great features to all of us who favour the Android platform.